Ah, colors. So great with all their shades. Red to orange to yellow to green and so on. The rainbow! All you have to do is put three or more reds next to each other and you've made orange. Easy! Do the same thing with orange to make yellow. Much too easy. But wait, now there are more colors that you need to place. And you need to place them strategically so they can make green, blue and purple! And then you have to be clever enough to match three purples! Not quite so easy, now. You'll have to think ahead, otherwise the board is going to fill up and it'll be sad songs and game over for you, my friend. But you're smart as a whip, and you'll soon be chaining red to orange to yellow to green like you were born into it. No ads, no in-app purchases, no chicanery. 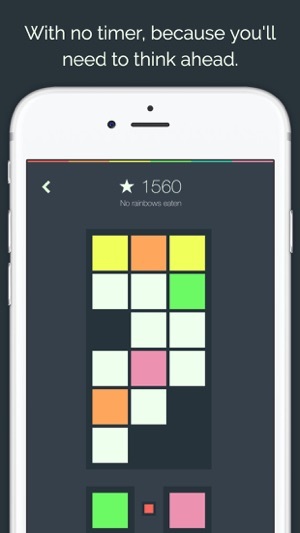 Just a fun puzzle game. * You can now save a tile as a spare to use later by dropping it where the bonus tile appears. ** If a tile is already there, you can't drop it. ** If a tile is there and a bonus is triggered, you won't get your bonus, so be careful! * You can now undo your last move. If you place a tile and decide you don't want it there, just double tap that tile to pull it back. ** You can only undo your last move. ** You can't undo the move if it resulted in a match. * Added 15 achievements to the game, including two hidden ones. Collect them all! * Added a rainbow strip to the top of the game view as a reminder to those of you that have forgotten the order of the rainbow since third grade. * Tiles have a new pulse animation that is triggered when you start moving them around. 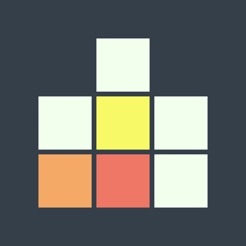 * New on/off animation for the grid tiles. * Added a "rate" button on the main menu. 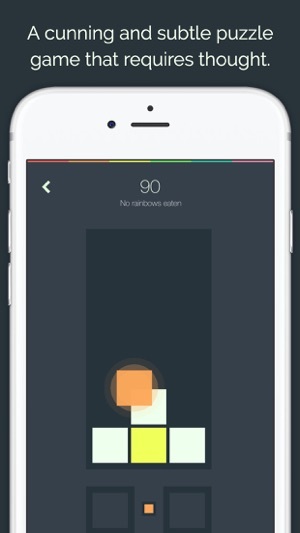 * Your best rainbow count is now displayed on the main menu beneath your best score. 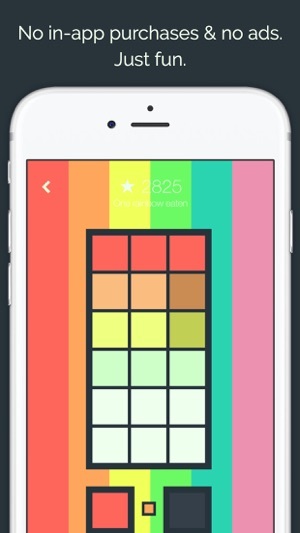 * If you beat your previous high score during a game, a star will appear next to the score. * Tile no longer jumps above your finger when you start moving it. This game is easy to pick up but hard to put down. You quickly learn that you need to think three or more turns ahead before you make your choice. Once you learn the progression of colors and get your first rainbow you will be hooked. It is very clever in its simplicity. I keep convincing myself to play one more game...and then one more. Well worth the two dollars I paid. At first blush this is a great game for kids. Then you pick it up and play. There's a strategic depth to this game that's surprising, frustrating and fun. The simplicity of playing makes for an easy learn and you'll be become reacquainted with ROY G BIV in no time. I'm not much of a gamer but I've always enjoyed puzzles and I love this game! Great for when you have idle time and you can pause at point.